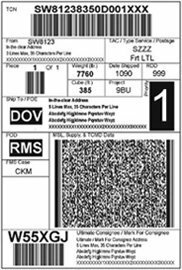 We offer stock integrated labels and stock integrated cards for color printers. Integrated labels come in several stock combinations from 1 label per 8.5″ × 11″ sheet to 2 labels per 8.5″ × 11″ sheet. The Integrated label adhesive is a hot melt adhesive adaptable to many surfaces with a minimum application temperature of 40°F and a service range of 35°F to 180°F. Integrated cards are available 1 per 8.5″ × 11″ sheet, up to three per sheet. For larger card sizes please see more Integrated Shipping Label options. LAYOUTS ARE FOR CARDS AND LABELS AT BOTTOM OF PAGE, BUT BY FEEDING BOTTOM END FIRST, THEY ARE AT THE TOP OF PAGE. Prices are for blank stock only. Prices for cartons of 1,000 sheets. Cutting die required. Pick one of our 3,000+ dies free of charge or create a new die. No die required for blanks. 100706-1 - One 3.5″ × 2″ label with rounded corners on 24# white laser bond. Label is located 0.5″ from left margin and 0.5″ from bottom of sheet. bottom with no space between labels. with rounded corners on 24# white laser bond. Label is 0.75″ from right and 0.625″ from bottom. Prices for cartons of 250-500 and 1,000 sheets. Cutting die required. Pick one of our 3,000+ dies free of charge or create a new die. No die required for blanks. 100706-5 - One 3.375″ × 2.125″ 8 mil printable card with rounded corners on a white plastic carrier laminated via a dual web to a 32# ledger cut sheet. Total sheet measures 8.5″ × 11″. Card is located 2.5625" from left margin and .75″ from bottom of sheet. 100706-6 - Two 3.375″ × 2.125″ 8 mil printable cards with rounded corners on a white plastic carrier laminated via a dual web to a 32# ledger cut sheet. Total sheet measures 8.5″ × 11″. Integrated Cards are centered at bottom of sheet, located 0.625″ from left margin, integrated 0.75″ from bottom of sheet and 0.5″ apart. 100706-7 - Three 3.375″ × 2.125″ 8 mil printable cards with rounded corners on a white plastic carrier. Total sheet measures 8.5″ × 11″. Cards are all justified left on sheet, located .625″ from left margin, .813″ from bottom and top of sheet. Cards are 1.563″ apart. Each card is on a perforated section equal to one-third of a sheet with card on plastic carrier attached to 32# ledger material. Prices for cartons of 250-500 and 1,000 sheets of stock "two-side printable". Cutting die required. Pick one of our 3,000+ dies free of charge or create a new die. No die required for blanks. 100706-7 - Designed for higher quantity “one-side printable” laser printing. Ask for a sample.